Lola is a high school girl with a passion for dressing up in costume and her 22 yr old rocker boyfriend Max, who her 2 dads are very disapproving of (for good reason, hello he’s 22!!). But Lola is determined to make this relationship work…. until her old neighbors, the Bells, move back in and bring with them a whole lot of unwelcome feelings. 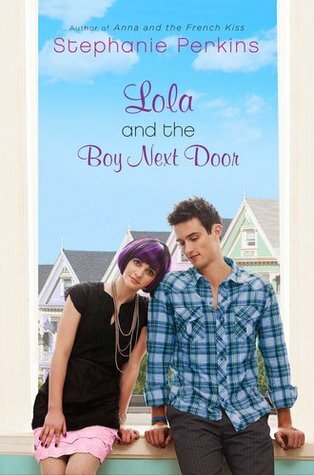 It turns out Lola has had a flirty past with the geeky/cool boy now living steps away… until he broke her heart. But now he’s back proclaiming he’s always liked her and she feels torn. Is it true love with her boyfriend? Are the feelings swirling around in her head just memories of how she once felt for Cricket (yes that’s the name of the crush-worthy boy in this book)? Or maybe those feelings are just resurfacing from the place she pushed them when he moved away…. I really liked Anna and the French Kiss, and I liked this one too, but just a little bit less. I think it was the costumes that did it. If Lola was interested in fashion, that I would’ve understood. But dressing up like a Halloween character everyday of the week did seem like someone who was hiding from herself. Plus, it’s super weird and hard to relate to…. am I supposed to feel bad that people made fun of her?? It was basically the same story as Anna and the French Kiss, except told from the opposite perspective, but I sort of liked seeing the other side in that dilemma. Anyhow, it was a super-fun read, and I’m glad I picked it up! This sounds like a really cute read! ^^ Great review!